The current forecasts gives us a 50/50 chance of catching this event in Austin. If you plan to photograph this event now is a good time to make plans. This is walk through my planning to pick a lens for a fixed tripod shot. I want to capture the eclipse from Austin, Texas from the start of the partial eclipse to near maximum eclipse at sunrise. One of the first things I consider in planning an astrophotography shot is the field of view that I will need to capture. This tells me the lens or telescope that I will need to capture the portion of sky that I need to. If it’s a conjunction that I’m shooting I’ll go to my preferred planetarium program (SkySafari) and measure the separation of the two planets as viewed from my shooting location. For this lunar eclipse, I want to capture the eclipse from the start of the partial eclipse at 5:48 AM CST until sunrise at 7:22 AM from a camera on a fixed tripod. This is 1 hour and 34 minutes or 1.57 hours. Because the Moon is relatively near the celestial equator, I can quickly calculate the field of view required with a little geometry and timing. The sky appears to rotate 360 degrees in 23.56 minutes, just about 15 degrees/hour. 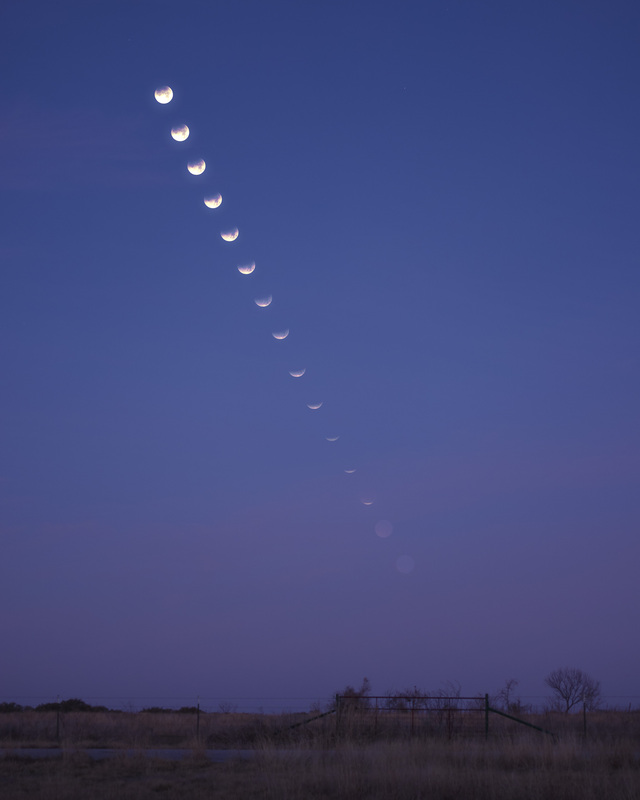 The Moon moves the same direction as the earth's rotation (360 degrees in 27.3 days or about 0.5 degrees, the width of the full Moon, in an hour. This is in the opposite direction from the sky's apparent motion. Thus I expect the Moon to move 1.57 x (15 - 0.5) or about 23 degrees during the time I want to shoot the eclipse. 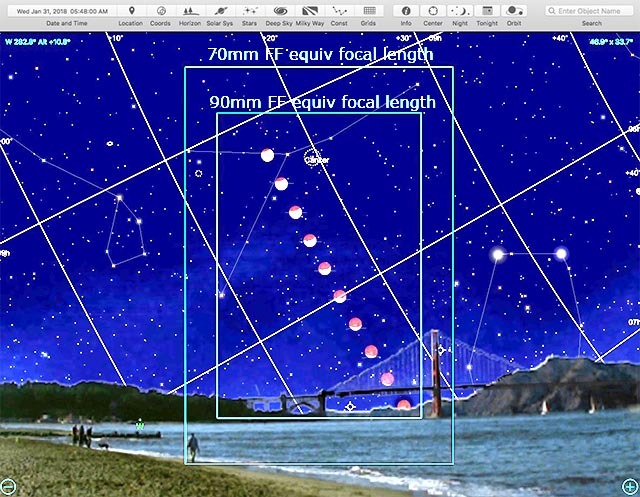 where f is the focal length in mm, w is the camera sensor width in the same units , and FOV is the field of view required. We should also allow a border in our shots. The calculations above use the long sensor distance, but the shot will have the Moon moving diagonally across the frame. A 3:2 aspect ration frame has a diagonal that is about 20% greater than the long side. A full frame focal length of 90mm is the maximum focal length that I could expect use for this shot. 70mm should allow for more relaxed framing. which is a focal length less than 1mm different from the exact calculation! A planetarium program like SkySafari will most of this work for you. I use a reticle that corresponds to my camera sensor and lens or telescope positioned on my target in the sky map. If your planetarium application supports telescope specific FOV cursor reticles like SkySafari, you can enter your camera lenses just like a telescope. Some lenses are marked with full frame equivalent focal lengths, be sure to use the native focal length instead (FF_fl / crop_factor). When your planetarium app doesn't support custom camera or telescope cursor reticles, it may have a circular reticle that you can customize to a specific field of view. Just use FOV= 2 arctan (w/2f) to calculate the FOV for your sensor size and focal length and use this as the reticle size. Here is how the shot actually turned out!